Do You Have a Loyalty Card? #1 NEW YORK TIMES BESTSELLER • Brené Brown has taught us what it means to dare greatly, rise strong, and brave the wilderness. Now, based on new research conducted with leaders, change makers, and culture shifters, she’s showing us how to put those ideas into practice so we can step up and lead. Don’t miss the hourlong Netflix special Brené Brown: The Call to Courage! Leadership is not about titles, status, and wielding power. A leader is anyone who takes responsibility for recognizing the potential in people and ideas, and has the courage to develop that potential. When we dare to lead, we don’t pretend to have the right answers; we stay curious and ask the right questions. We don’t see power as finite and hoard it; we know that power becomes infinite when we share it with others. We don’t avoid difficult conversations and situations; we lean into vulnerability when it’s necessary to do good work. But daring leadership in a culture defined by scarcity, fear, and uncertainty requires skill-building around traits that are deeply and uniquely human. The irony is that we’re choosing not to invest in developing the hearts and minds of leaders at the exact same time as we’re scrambling to figure out what we have to offer that machines and AI can’t do better and faster. What can we do better? Empathy, connection, and courage, to start. How do you cultivate braver, more daring leaders, and how do you embed the value of courage in your culture? In this new book, Brown uses research, stories, and examples to answer these questions in the no-BS style that millions of readers have come to expect and love. 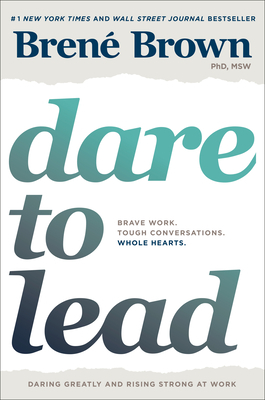 Whether you’ve read Daring Greatly and Rising Strong or you’re new to Brené Brown’s work, this book is for anyone who wants to step up and into brave leadership. Brené Brown, PhD, LMSW, is a research professor at the University of Houston, where she holds the Huffington Foundation–Brené Brown Endowed Chair at the Graduate College of Social Work. She has spent the past two decades studying courage, vulnerability, shame, and empathy and is the author of four #1 New York Times bestsellers: Braving the Wilderness, Rising Strong, Daring Greatly, and The Gifts of Imperfection. Her TED talk—“The Power of Vulnerability”—is one of the top five most-viewed TED talks in the world with more than thirty-five million views. Brown lives in Houston, Texas with her husband, Steve, and their children, Ellen and Charlie.